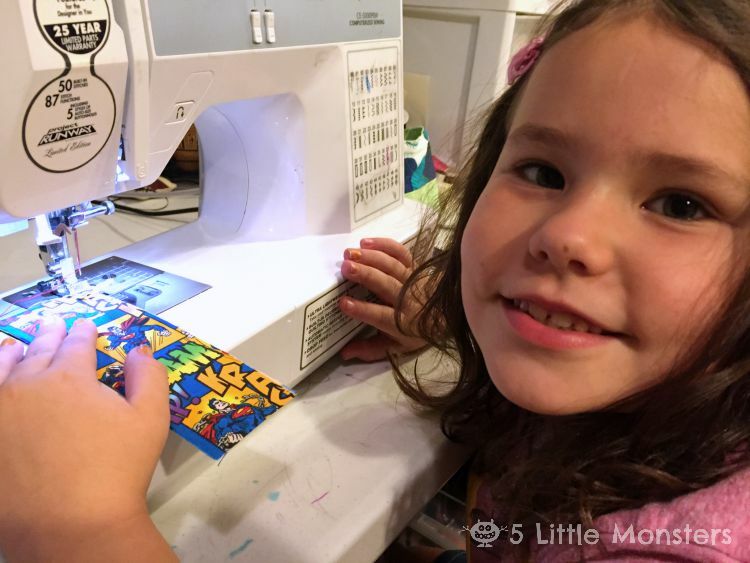 I have a little girl who has been begging me to teach her to sew for a while now. I started her with some simple embroidery but she got bored with that pretty quick. She really wants to learn to sew with the sewing machine. I have been trying to come up with something that would be really easy for her to make for her first try at the machine. 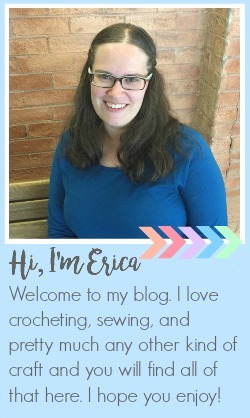 I thought of lots of really simple projects that are just sewing straight lines for the seams, things like skirts or pillowcases. But for her first project I wanted something where she wasn't sewing seams so that if her seam allowance wasn't even it wasn't a big deal. That might come from the fact that the first thing that I remember sewing was a quilt and my seam allowances were kind of all over the place, sometimes way too close to the edge, so the first time through the wash it started to fall apart. I have been working with Fairfield World and one of the things that they do is make interfacings. They sent me some samples of all of the different ones they have and one of them is a super stiff, double sided fusible interfacing. I had the idea to cut a piece of that interfacing the size of a bookmark and a piece of fabric the same size to iron on to each side and then let her topstitch around the outside. I figured that since everything is already stuck together it should be pretty easy, she wouldn't need to hold the fabric together and she would just be topstitching so it wouldn't matter how straight the stitching was. It was a huge hit. She loved it. My original plan was to leave them as plain rectangles but she insisted that they needed tassels and beads so we ended up adding those too. I took a picture to show to my husband and he requested that she make him one. We went to the fabric store so she could pick out some Superman fabric for Dad's bookmark, we ended up with some Superman and some Doctor Who. 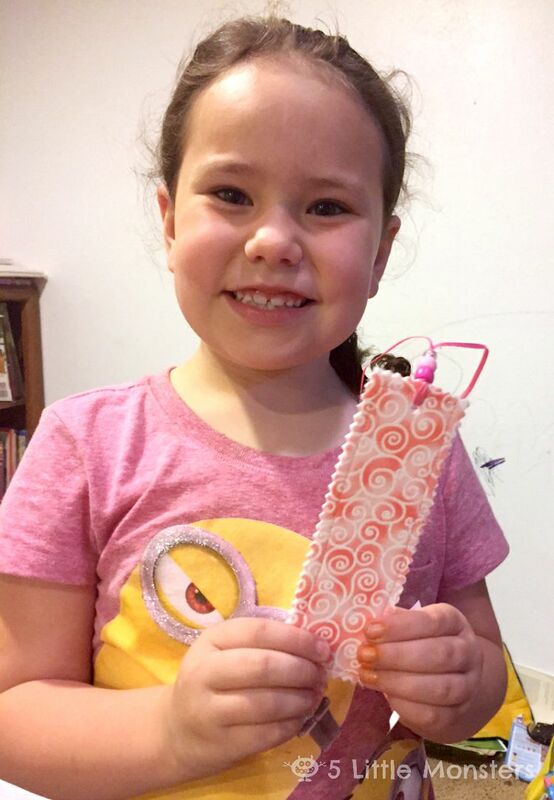 She was so excited to make a special bookmark for her dad. 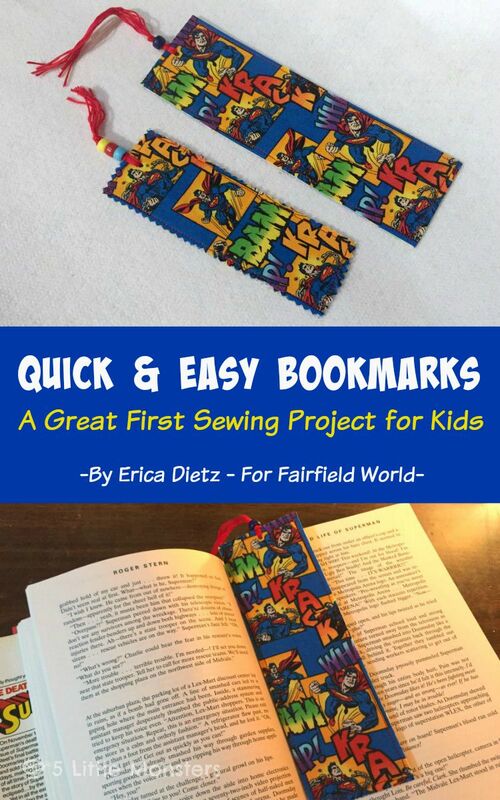 In fact, I was really busy the next couple of days so it was 2 or 3 days before we were able to make them and several times a day she would ask if we could make daddy's bookmarks. She would say tell me that he really wanted her to make them and that he would be sad if she didn't get them done. After a couple of days we finally sat down to make them and she was so proud to give them to him when he got home from work that night. I think it made her feel pretty special that dad had asked her to make something for him and she did. The only problem now is that now that she has sewn something I am pretty sure she thinks my sewing machine and all of my sewing stuff is as much hers as it is mine. At first that didn't bother me that much because I love seeing her be creative even if it means that I am constantly finding my box of ribbons and trims open with pieces chopped off so that she can tie them around something to make it pretty. I wasn't quite as okay with it when I saw her cutting up a piece of cardboard with my good sewing scissors. Those are mine.